Does "Sync Button" in hotkey settings mean "Refresh" in Wiimote window? 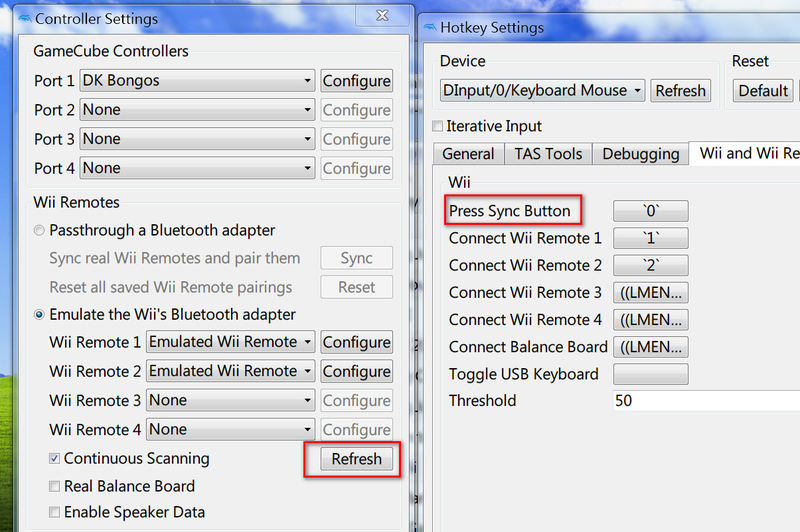 I am curious about whether "Sync Button" in hotkey settings means "Refresh" in Wiimote configuration window. Nope! The Sync hotkey engages Bluetooth Passthrough's Sync button. Without Bluetooth Passthrough, the hotkey does nothing. (10-29-2018, 04:51 PM)MayImilae Wrote: Nope! The Sync hotkey engages Bluetooth Passthrough's Sync button. Without Bluetooth Passthrough, the hotkey does nothing. Oops, I thought the Sync hotkey = Refresh in Wiimote window = the Sync button on the Wii console. ...Yes, it's the Sync button in Bluetooth Passthrough. Only Bluetooth Passthrough is capable of syncing with Wii Remotes. Our Emulated Bluetooth Adapter system is incapable of syncing; it only connects with Wii Remotes temporarily. "Refresh" causes the Emulated Bluetooth Adapter to look for Wii Remotes to establish that temporary connection. It does not Sync. Of course you have Continuous Scanning enabled, so as long as the Controllers window or a Wii game is running, Dolphin is always looking for Wii Remotes to temporarily connect to. You don't need to press Refresh at all! (10-29-2018, 06:55 PM)MayImilae Wrote: ...Yes, it's the Sync button in Bluetooth Passthrough. Only Bluetooth Passthrough is capable of syncing with Wii Remotes. Our Emulated Bluetooth Adapter system is incapable of syncing; it only connects with Wii Remotes temporarily. "Refresh" causes the Emulated Bluetooth Adapter to look for Wii Remotes to establish that temporary connection. It does not Sync. The Sync hotkey = Bluetooth Passthrough's Sync button = the Sync button on the Wii console. The "refresh" is used for looking for Wii Remotes to establish temporary connection rather than sync.